NEW YORK, New York — We are most proud to announce that Sunday, February 28, His Beatitude Nerses Bedros XIX Catholicos Patriarch, on behalf of His Holiness Benedict XVI, awarded St. Gregory the Great Order medals (instituted in 1831 by Pope Gregory XVI) to Bedros Terzian and Vahe Jazmadarian in recognition of their longtime contribution and instrumental role in the humanitarian efforts in Armenia. The awards ceremony was attended by a distinguished roster of guests from different countries including Ambassador Extraordinary and Plenipotentiary of Armenia to Italy Mr. Ruben Karapetian, Armenian catholic bishops. The grandiose ceremony took place after the Sunday mass in the Armenian Catholic Convent of Rome. 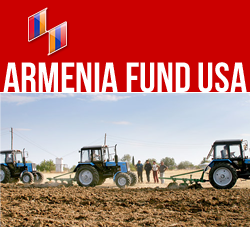 Bedros Terzian and Vahe Jazmadarian, both honored members of the Fund’s Board of Trustees, have been dedicated to the Fund’s mission of advancing the economic and infrastructure development of our homeland since its foundation.